The post Mange in Dogs: Let’s Talk Causes and Treatments by Melvin Peña appeared first on Dogster. Copying over entire articles infringes on copyright laws. You may not be aware of it, but all of these articles were assigned, contracted and paid for, so they aren’t considered public domain. However, we appreciate that you like the article and would love it if you continued sharing just the first paragraph of an article, then linking out to the rest of the piece on Dogster.com. Mange in dogs is not one thing, but rather an umbrella term for a number of possible disorders that affect dogs, all of which are caused or initiated by parasitic mites. These microscopic arthropods may take up residence either in a dog’s hair follicles or in his skin. There are two major types of mange in dogs, each caused by a different mite. Briefly, demodetic mange, which is not contagious, is the most common, and is caused by a surplus of Demodex canis mites in a dog’s hair follicles. Sarcoptic mange, also known as scabies, is a devastating variety caused by Sarcoptes scabiei canis mites that burrow into a dog’s skin. Why does mange in dogs happen? 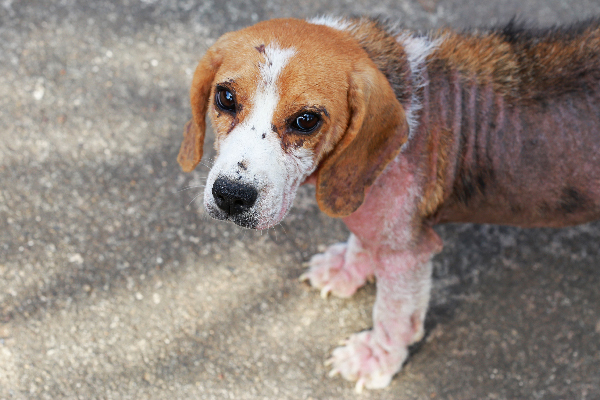 A beagle dog with mange. Photography ©Thanawath Seangsuriyapone | iStock / Getty Images Plus. Whether it is demodetic or sarcoptic mange, mange in dogs arises when a dog’s immune system is not equipped to handle a surplus population of mites. For the most part, mange predominantly affects very young puppies, very old dogs, or dogs whose immune systems are weakened or compromised by the stresses of mistreatment or neglect. In certain breeds, such as Afghan Hounds, Beagles, Bulldogs, Chihuahuas, Collies, Dachshunds, Pugs, Shar-Peis, Shih Tzus and Terriers, among others, susceptibility or predisposition to demodetic mange might be genetic, but that does not make it common. Mites themselves do not cause the outward signs of mange in dogs. Rather, unhealthy dogs cannot manage their native mite populations and become weaker. Weakened dogs are then open to further infections, which, coupled with a dog’s incessant scratching and biting at affected areas, leads to the symptoms we associate with mange in dogs — to wit, bald patches on the face or body, preternaturally wrinkled skin, and scabby lesions. A mite that goes by the name of Demodex canis is the little bugger at the root of demodetic mange in dogs, which is also called red mange. You may be surprised to learn that Demodex mites are probably living, working and playing in your dog’s hair follicles right now! There is no cause to worry, though. Demodex mites are very common; almost all dogs who are weaned by their mothers have demodetic mites and continue to throughout their lives. Demodetic mites are referred to as “commensal” organisms. You’ll be familiar with the term “symbiotic,” which means that two organisms live together and derive benefits from each other’s presence. Commensal organisms are a step removed from that relationship; Demodex mites live and feed on a dog, gaining all the benefits, as it were, while the dog usually suffers no ill effects. Demodetic mange is likely what you think of when you picture mange in dogs. Localized demodetic mange in dogs is quite common in puppies, actually, who acquire the mites while suckling at the mother’s teat. Since their immune systems are not yet fully developed, the mites who travel onto their faces may prove too much to handle, leading to small patches of hair loss on their heads. Demodetic mange in puppies goes away on its own with no treatment as the puppy’s immune system adapts to the presence of mites. This kind of mange is also common in older dogs as well as those with weak immune systems. Demodetic mange in dogs is not contagious. It is normally only while they are puppies that demodex mites can pass from dog to dog. Generalized mange, with its characteristic balding patches, occurs when the demodex mites already present proliferate beyond the ability or capacity of a dog’s immune system to cope with or contain. Even particularly bad cases of demodetic mange in dogs tend to affect only the surface of a dog’s body. Sarcoptic mange is more insidious; the sarcoptes mites burrow deep into a dog’s skin. Within a week, a dog with sarcoptic mange may start developing open sores, which are less from the mites themselves, but rather from the dog’s frantic scratching. That scratching may turn to biting as the dog attempts to forcibly extract the source of the itch. Open wounds can then become infected as health issues cascade and the dog’s health rapidly deteriorates. Sarcoptic mange is less common for domestic dogs who have stable home environments than demodetic mange. Though sarcoptic mange is highly contagious, it tends to affect dogs who are suffering from severe malnutrition or starvation. Dogs that are already weak from neglect or abuse will have already-compromised immune systems where the sarcoptes mite can wreak havoc and thrive. While demodetic mites are neither contagious nor zoonotic, sarcoptic mites are both. They can not only pass between dogs, but between dogs and other animals, as well as between dogs and humans. It is not uncommon for puppies to acquire demodex mites from their mothers while feeding. Overwhelmingly, the localized demodetic mange that can develop on their heads will clear up as puppies’ immune systems develop. For adult dogs who develop demodetic mange, a veterinarian should be consulted as soon as symptoms manifest to determine a course of action. Topical ointments that contain benzoyl peroxide are often prescribed to rid the dog of excess mites and allow the lesions to heal and hair to grow back as the dog’s immune system reasserts itself. If benzoyl peroxide sounds familiar, that’s because it’s the active ingredient in many acne medications. Older dogs or dogs with sarcoptic mange may require far more intensive treatment. An outbreak of mange in dogs is frequently tied to environmental circumstances and general health. Mange in dogs is less common in dogs that are cared for, well fed, bathed on a regular basis and who have clean beds. Tell us: Has your dog had mange? What are your tips for treating mange in dogs? Thumbnail: Photography © Adrian Wojcik | iStock / Getty Images Plus.